In 1944 the National Foundation for Junior Museums was created by John Ripley Forbes who grew up in Stamford, Ct. where William T. Hornaday lived and under Dr. Hornaday's tutelage, became a well known naturalist and explorer. The foundation was created "To perpetuate the memory of the late William T. Hornaday through the establishment of this corporation as a living memorial for the benefit of children and others." It appears that this foundation was also known as the “William T. Hornaday Foundation” and currently appears to be called the “Natural Science for Youth Foundation”. In May 1954, the foundation voted to create a gold medal for extraordinary leadership in the Junior Museum movement on a national level, naming it the William T. Hornaday Memorial Award. They also authorized that Dr. Hornaday's words, "Open Wide To Youth All Gateways To Nature", be inscribed upon the medal. To receive the award required no less than ten years service to the field of nature study and conservation education. You could not nominate yourself for the award. The award was not and is not connected with the Boy Scouts of America. 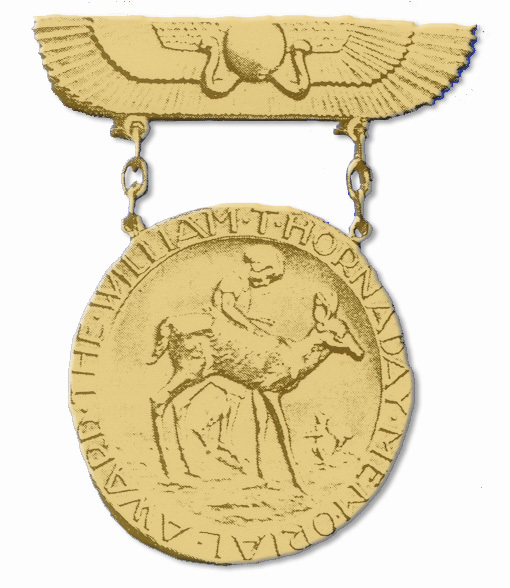 The design included the winged badge that was the logo for the original Permanent Wild Life Protection Fund, which was created by Dr. Hornaday in 1913. Instead of using a ribbon to connect the badge and medallion, they were connected with chains as pictured.